I've probably said this before but I particularly enjoy Rachael's appointments because she has the same taste in nails as me so I typically can make a few suggestions and find something she loves. 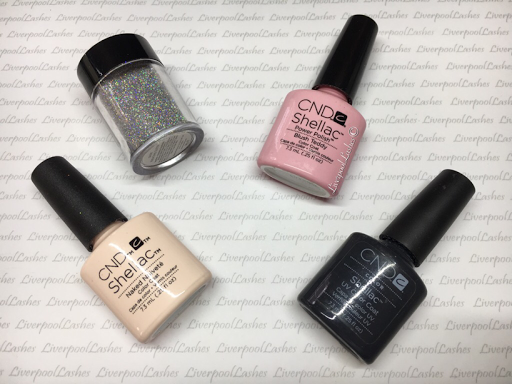 Rachael wanted a pale pink, silver and grey so we chose CND Shellac in Blush Teddy, Asphalt and Naked Naïveté with Lecente Fireworks Glitter in Spark. 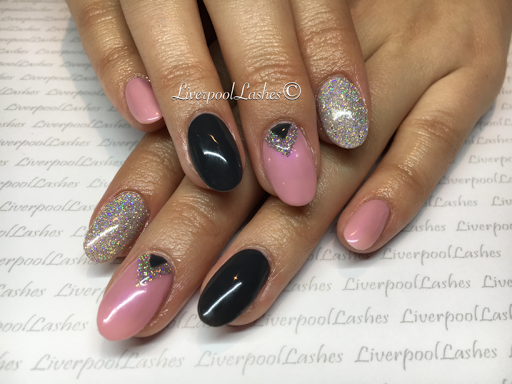 After seeing my colour pops for my Top 15 Lecente Glitters video (click here) she fell in love with Naked Naivete with Lecente Spark over it. I applied Asphalt to her thumb and ring finger (despite it looking black on the photo) Blush Teddy is on her middle and little finger and Naked Naïveté with Spark glitter in on her index finger. I then mixed Spark glitter with top coat, drew the chevron on her little middle and cured it. Finally I used Asphalt to add the centre triangle, curing and applying a top coat.